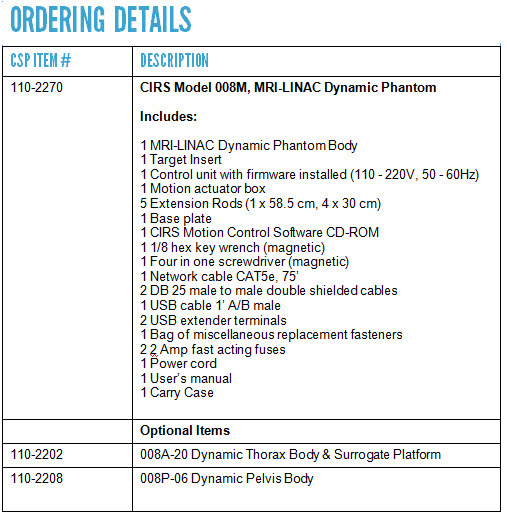 Please note that for Viewray Systems™, contact customer service for information on part number 008V. 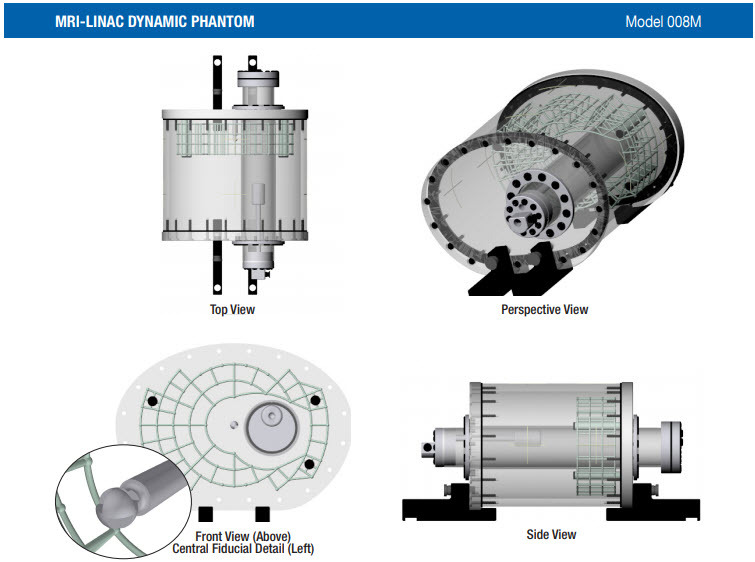 The CIRS MRI-LINAC Dynamic Phantom is designed for end-to-end commissioning, machine QA for hybrid MRI-LINAC Radiation Therapy systems, and verification of gated and adaptive treatment plans. The Model 008M provides a means to assess MRI image quality, and to test tumor localization and motion-capturing devices. The phantom can be used to acquire moving or static target images for treatment planning and verification of gated or adaptive treatment delivery. The phantom body, moving rod with target and extended rigid shaft connection are MRI-safe with 1.5T magnets. Motors and motion controller electronics are located at a safe distance from the magnet to ensure MRI image quality. 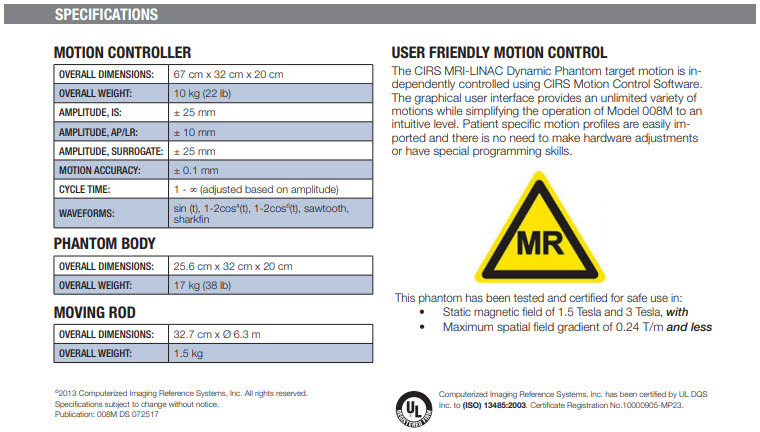 The MRI-LINAC Dynamic Phantom utilizes CIRS Motion Control Software to provide precise, repeatable 3D target motion. The phantom body approximates an average human body in size and shape. It is comprised of a plastic shell with a cylindrical thru hole to accommodate a moving rod with simulated target. The shell is filled with proprietary MRI signal-generating gel that allows for quick and easy phantom set-up without liquid motion artifacts. The phantom body is suspended on non-magnetic rails that allow for coil positioning and phantom registration to the couch. The moving insert with simulated target is a sealed, cylindrical rod filled with the same MRI signal-generating proprietary gel as the phantom body. The embedded MRI/CT target is made of MRI gel that provides contrast with respect to the background. This target can receive an ion chamber or other MRI-compatible dosimeters for treatment dose verification. There are laser marks machined on the outside of MRI shell body for both the MRI/CT target and MRI Distortion Grid. To facilitate MRI/CT Image fusion, there is a central fiducial aligned with the exterior laser marks, and in a known position with respect to 3D spatial distortion grid.